The furious pace of work on my big work project has unfortunately stunted promotion of my book, Ndewo, Colorado, but with a little help from my fellow poet friends I have a couple of upcoming readings and other events. 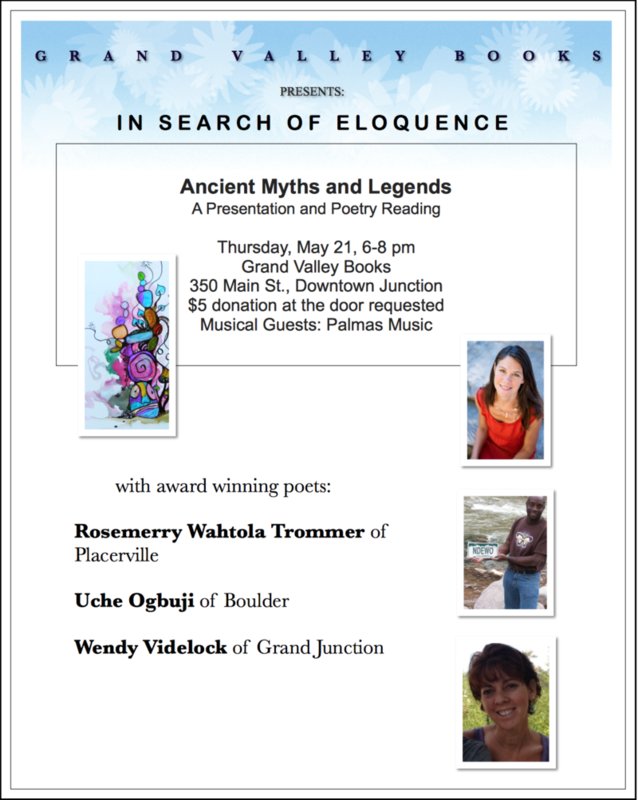 I'll be reading with Wendy Videlock & Rosemerry Wahtola Trommer (absolutely stellar company!) in Grand Junction, Colorado the 21st of May. Our theme is "Ancient Myths & Legends." The three of us generally don't do your plain old stereotypical, angst-projecting poetry readings, so do come along for a treat if you're around the Western slope then. From June 4-7 I'll be participating in Mystery and the Peripatetic, a poetry festival and retreat in Breckenridge, Colorado, run by the same, boundlessly energetic Wendy Videlock. The session I'll be leading Saturday late morning is titled "The Speakers: A Look at Dialect and Idiom from Around the World." Update: Photos from the retreat.